Snake fans and wildlife lovers, listen up- we have a very interesting story to share with all of you! Besides our usual veterinary care of pets and domesticated animals, we at Noble Hound do all we can to help wild animals when called upon as well. Recently, a pair of very observant passers-by noticed that a snake beside their path was moving awkwardly in the grass and leaves. Usually when a person comes across wildlife, it is best to give the animal space, leave them be, and if you're lucky, come away with only a photograph. These kind people took a closer look at the snake and noticed that there was something obstructing the snake's proper movement around his belly. Thinking that he may need care from a qualified professional, they brought the snake to Noble Hound to see if Dr. Melissa could help. It turns out that this particular snake was a young Eastern Fox Snake, or Pine Snake. Their pointed tail distinguishes them as a non-venomous species, and are very common in Wisconsin. 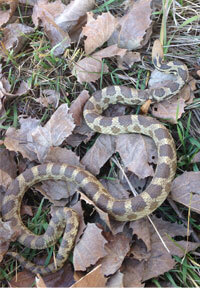 This little guy was less than two feet long, but Eastern Fox Snakes snakes can grow up to about 50 inches long! 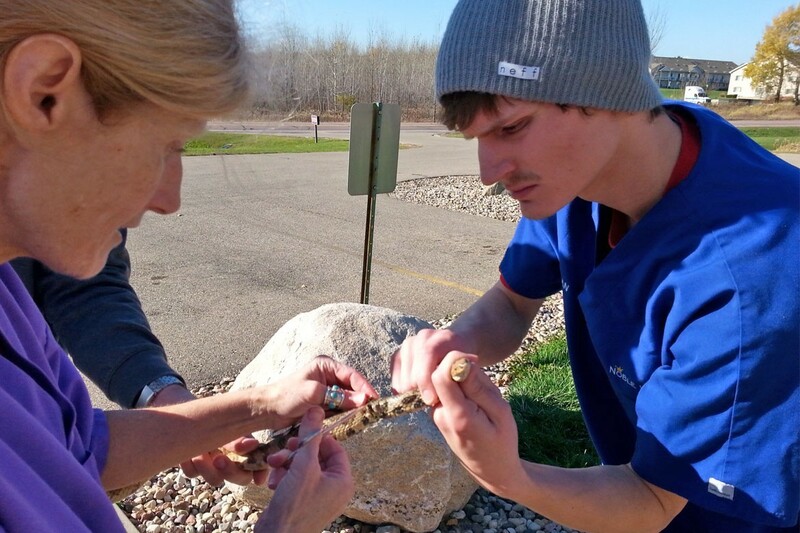 With Keenan's help, Dr. Melissa gave the snake a quick exam and found he had a plastic piece of trash around his midsection. After carefully removing the plastic and a friendly scratch on the head, the little snake was back on his way through the dewy grass and crunchy leaves to look for his next ssssnack! Noble Hound would like to thank the lovely strangers for having the compassion and observant minds to bring this young snake to us to get help. May this story be a reminder to us all that we share this planet with many other creatures and we must think responsibly of the plastic trash we consume and leave behind. Unless wild animals are in distress and need qualified care, lets leave our wildlife to the wild.